This is a another darling Vintage, or Victorian, Calling Card! This one shows some pretty Violet Flowers. There’s a blank space where you could write a message if you like. I always think these make such great Gift Tags or nice to use as a Label too! Gorgeous Vintage Peach Rose Frame Graphic! 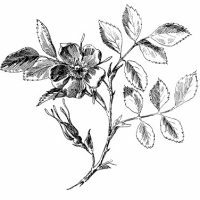 Antique Graphic – Wild Rose Engraving Romantic Feathers and Roses Image! Karen: This violet card is just what I was looking for for my spring facebook cover. I did some quick personalization and viola I am thrilled. Thanks so very much. Oh Karen this is beautiful – love it! I particularly love this since I’m a February “baby”! Thank you! It’s beautiful!